"DOES A STONE LOOK THE WAY IT FEELS?" The author's interest in tactile graphics stems from his involvement in teaching English as a foreign language to visually impaired children. A foreign language, like no other subjects offers an opportunity to engage the children in a host of activities requiring good understanding of spatial relations. The need to design adaptations of the highly visual content of foreign language course books has forced the author to look for solutions and educational tools which would prepare congenitally blind children for their first contact with tactile drawings. There is no better way to learn about blindness than to engage in direct contact with children who cannot see. Talking to them, and listening to the questions they ask reveals a mysterious and intriguing world, where time and space seem to blend into a new dimension, where the concepts of "relevant" and "irrelevant" are turned upside down, where minute details of the environment, insignificant puffs of the air and hardly audible noises and changes in the tone of one's voice are crucial for finding one's way around and for interpreting what is being said. "What colour is the wind? ", "Does a stone look the way it feels? ", "I know how fish swim, but how do they walk? ", "I can hear that I've lost my way but I don't know where I am", "I think I know what it's like to see: It's like telling the future because you know now that there will be a tree and I will know later, when I come up to it and touch it" - all of these questions and remarks strike a sighted person as unusual. But for blind children they are a normal way of expressing interest in the invisible world which surrounds them. They are their own interpretation of what lies beyond that impenetrable border between light and darkness, constant dimness or fragmented, highly deformed picture of the most immediate environment. These questions and comments are also an attempt to place that vast outer space stretching beyond the fingertips, within some logical, manageable structure which could help understand such mysteries as the fact that a toy released from one's grip does not disappear for ever but continues to exist; that a child can resemble an adult, even an old person with a wrinkled face and rough hands; that a sighted person can recognise friends on a smooth, slippery piece of paper called "a photograph", and that sighted people can see tall trees, houses and mountains through a small window, even if the window is shut. It is impossible to overestimate the role that language plays in helping a visually impaired child understand all of those mysteries requiring a good understanding of visual concepts. The importance of talking to the child, and explaining what is happening in the environment, so emphatically stressed by specialists in early intervention is therefore fully justified. must precede presentation of these elements in the spatial configurations which are the object of the exercise. boarding the bus and one line representing a seat - shows the scale of the problem one has to face when designing tactile graphics which will make sense to a child who cannot see. While three lines used for representing a bus make perfect sense to a blind child, they may not be a clear representation of a table, chair or a bed. In order to explain this highly symbolic, two-dimensional representation of three dimensional objects the author has developed a simple tool called Transfograph which 'transforms' objects into drawings. Models of different pieces of furniture slide into matching slots in wooden plates, revealing an outline which can be compared with tactile drawings of the frontal view of these objects. A picture of a teddy bear which a sighted child will recognise at a glance may not be easy to interpret for a blind child, as a graphic representation of the cuddly bed-time companion. Still, engaging a blind child in such activities provides a useful exercise in understanding the body parts and how they are related to one another. The complexity of the picture can be solved by introducing the significant elements in a sequence. With one element added at a time, first the head, then the ears, eyes and so on, the child can gradually build a complete two-dimensional representation of the toy. A real teddy and a magnetic puzzle consisting of flat shapes which can be assembled into a teddy bear provide additional support in understanding the relation between an object and a drawing. Understanding the principle on which the symbolic two-dimensional representation of simple objects is based makes it easier for the child to interpret more complex graphics. Developing a 'library' of symbolic representations makes it possible to introduce a large range of activities depending on the understanding of spatial relations represented graphically. One of them, a simple picture story of milkman Mat delivering milk to houses in Flower Street was developed with the help of the techniques introduced earlier - matching objects to drawings and sequencing. Such stories have a wide range of applications - from foreign language teaching and numeracy to orientation, mobility and leisure. A picture of a table mat, seating arrangement at the dinner table, or drawing a picture which shows the arrangement of furniture in the child's room are all invaluable activities preparing the child for their geography, geometry or science, where the demand for meaningful tactile illustrations is the highest. Representing graphically three-dimensional geometric shapes such as cubes, where the perspective and the broken lines representing invisible edges change the original cube beyond recognition, is a particular challenge for those designing tactile adaptations of educational materials for totally blind learners. 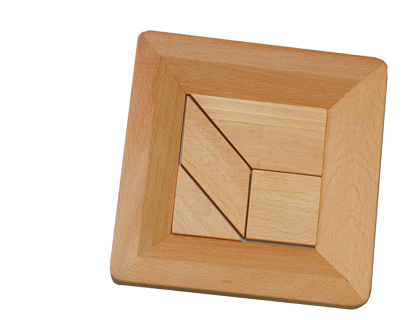 To deal with this particular problem, the author has designed a Cubograph - a model of a 'skeleton' of a cube which adapts to different perspectives from which it is looked at. Squashed flat, it reveals edges with carved markings, representing broken lines used in drawings to show those edges which are invisible from a particular perspective. Clever Triangles - a geometry puzzle consisting of triangles mounted on magnets and a set of tactile and colour overlays, for explaining that rotation does not change the shape, or that different combinations of right angled isosceles triangles can be used to build larger triangles, squares, rectangles etc. Shape Detective - is a set of different geometric shapes different combinations of which can be used to fill in tactile outlines of large squares, rectangles etc. Playing with shapes - is a set of overlays for a magnetic board to allow the child look for familiar shapes in different objects surrounding the child. Watch me draw (Space Master) - is a set designed to give a visually impaired child an opportunity to practice drawing different geometric shapes and for designing the internal composition of a complex shape. The tools and activities described above seem to have had a positive effect on the understanding of spatial relations by children included in the 'English language programme for visually impaired children. Improving their ability to draw and to interpret tactile graphics has considerably increased the range of activities which can be introduced as part of a foreign language course. 1. the children's confidence that with poor vision, or even without sight they can be in command of the space around them. 2. their confidence that geometric shapes are just different fragments of space. 3. their confidence that the space which surrounds them can be managed - that it can be altered and divided in many different ways and that they, the children themselves are the ones who decide how they want to change it.